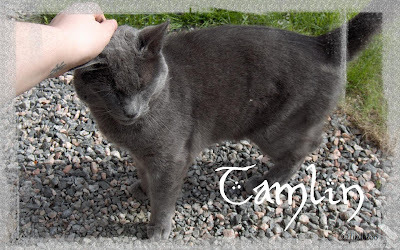 Kjapp posting nå for å få blogget før fristen! 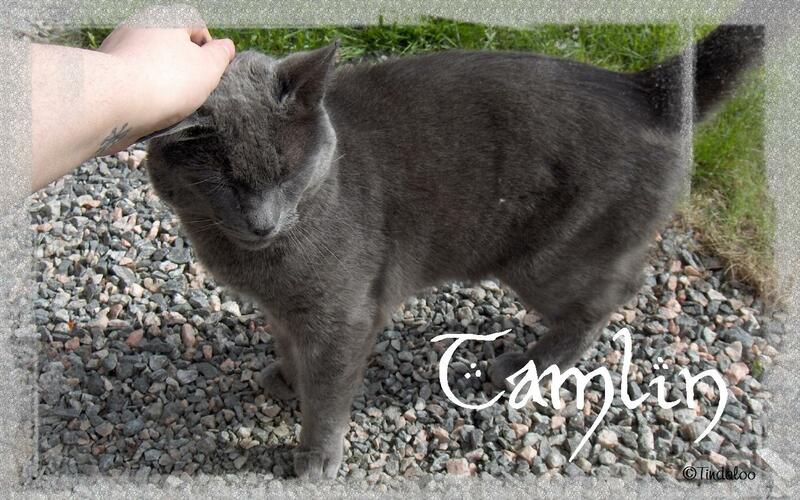 *lol* That's just so cute har denne utfordringa: She`s So Cute #11 fra Merete - 'Den store dagen'. Og jeg har lagd konfirmasjonskort! :) Elsker dette stemplet - såå kjekk atte! 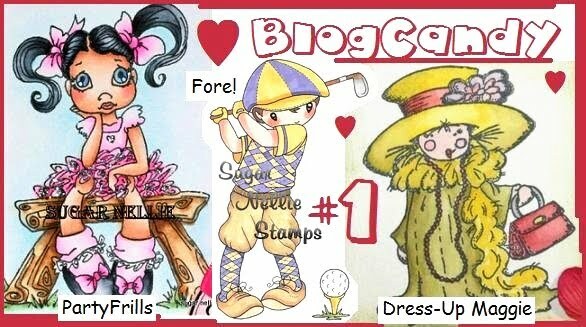 The norwegian challenge blog That's just so cute's theme is "The BIG day" She's so cute #11. And I've made a confirmation (?) card. Stamps/Image: North Star Stamps 'Single Steven'. Text from Kreativ Hobby. Paper: Bazzill Cardstock. 7 Gypsies 'Gypsy market' 6x6 pack. Prima 6x6 'Youth Collection' paper pad. Embellishments: Spellbinder Nestabilities - Labels 8. Paperthread from Panduro. Cross-charm from ..? Tim Holtz Cuttlebug 5x7 Embossing die 'Clockworks'. Denne uken har Cute Card Thursday challenge Bloggen lagt ut Challenge 162 ~ Sketch ~ Enten med en tidligere skisse, fra en annen challenge, eller lage en selv, og jeg har gjort det sistnevnte :) Jeg lagde kortet i grønt og blått, til Southern Girls farge utfordring, og Cards For Men #9 er å bruke sirkler. I made the card also with the Southern Girls colour challenge in mind ~ GREEN & BLUE, and added brads & tim holtz' clockworks - for the Cards For Men #9. Circles. Paper: Bazzill Cardstock & plain papers. Dette stempeltrykket er et eksempel på at man kan fikse på feil man gjør! Det var kommet en grønn malings flekk i hennes gyldne blonde hår - og dermed var jeg på tur til å kaste det - men isteden fikk hun ravnsvart hår :) For å se hvordan det egentlig skulle sett ut, ett tidligere kort med dette trykket..
Kombinerer 3 utfordringer til dette kortet Crazy Challenge #61. Blomster, Craft Your Passion #52. Fritt tema, og Creative Insp. #106. Bruke punchere og/eller dies. 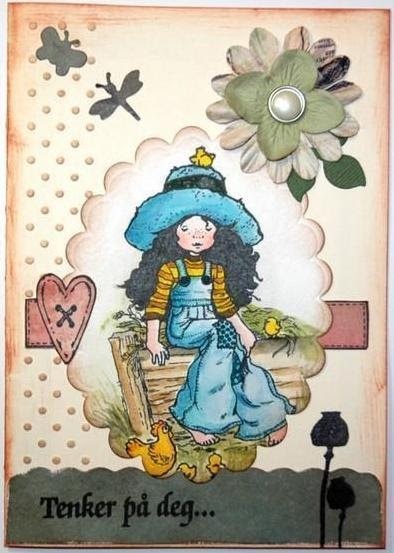 This stampmotif was actually on it's way to the bin when I ruined it with a big green spot on her golden brown hair!!! Instead I made her hair big, fluffy, and BLACK - covers everything! ;) Here's an earlier card 2 show how it should've looked like! I enter it in: The Crazy Challenge #61. Just add Flowers, Craft Your Passion #52. Anything Goes!, og Creative Inspirations #106. Use punches &/or Dies. Stamps/Images: Stampavie - Sarah Kay 'Sarah on the farm'. Hänglar & Stänglar club kit fall/winter 2008 - heart label. Stampington & Co. Clearly impressed - Fresh flowers elements. Text stamp unknown. .
Embellishments: Quickutz bugs mini RS-0063 & RS-0101 leaf. Spellbinder Nestabilities 'Oval classic Scallop Large' S4111. 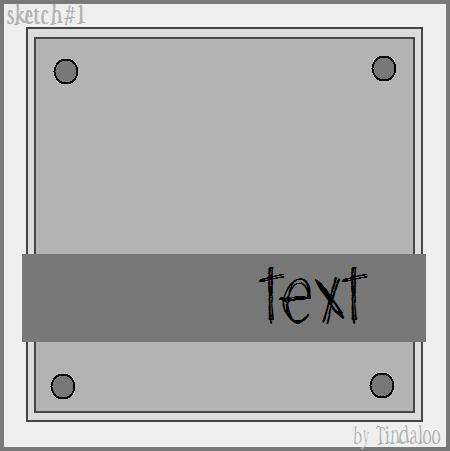 Cuttlebug Embossing folder - A2 Borders 'Just My Type'. Marvy Uchida Trimming Buddy - Scallop rotary blade. Prima flowers & Panduro bling pearl brad. 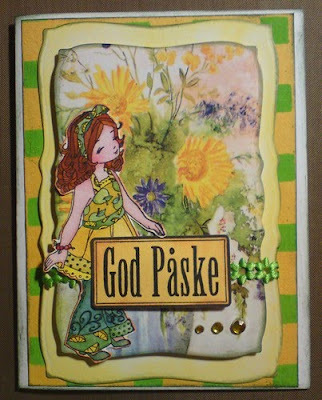 God Påske ~ Happy Easter! Don't forget I got yummy candy some posts below!!! Stamps/Image: Whiff of Joy - Elisabeth Bell 'Willow in the summer breeze'. Text 'God Påske' = 'Happy Easter' stamp from hÄnglar & stÄnglar. Flower image cut from an old postcard. Paper: Plain Cardstock & Unknown papers. Embellishments: Spellbinder Nestabilities - Curved Rectangles S5006. Flower ribbon from Panduro Hobby. Yellow bling from Pierres du Rhin Dollarama 'China'. The April challenge at StampARTic is to make a Easter card where the main color are YELLOW + one color of your choice. Green & yellow looks pretty 'eastery' to me! Stamps/Image: Image cut from a florist Paperbox card. 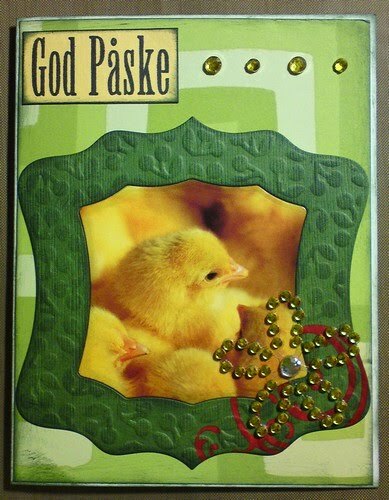 Text 'God Påske' = Happy Easter stamp from hÄnglar & stÄnglar. 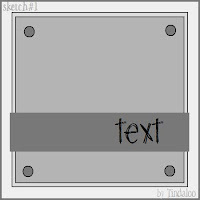 Paper: Bazzill Cardstock. Unknown retro paper. Embellishments: Spellbinder Frameabilities - Cherry Pickin' SBS5-021. Unknown red rubons. Me & My BIG ideas 'Flower' rhinestone. Yellow bling also from Pierres du Rhin Dollarama 'China'. The #1. prize is PartyFrills, Fore! & Dressing-Up Maggie from the awesome Sugarnellies! Unmounted rubberstamps. #2. 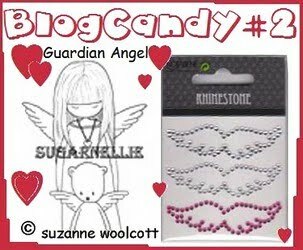 The Gorjuss Guardian Angel from Sugarnellie and Susanne Woolcott. Unmounted rubberstamp + sparkly Rhinestone wings! 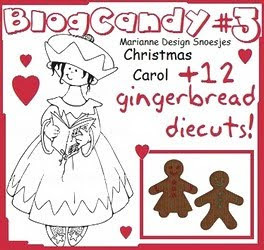 #3. is from Marianne Design Snoesjes - Christmas Carol! Wich is a clearstamp + some gingerbread diecuts in brown bazzill from Quickutz. Own a blog and post about this candy on your blog or sidebar. Please feel free to add one of the pics too! 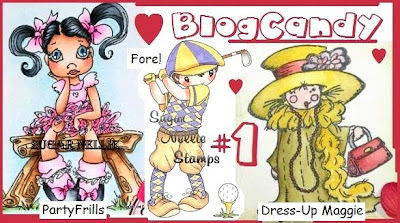 Leave only ONE comment on this post, along with your blogs address, and let me know the name of your favourite stamp companies! (for ex. Penny Black, Sugarnellie etc.) Chances are I got it - after all I'm a rubberholic.. - and I'll add some stamped motifs to the mix! WOW - has it really been such a long time since my last blogpost?! It didn't feel that long! I moved to a new apartment in november, actually the entire move took up most of october, november and december - and now we're well into the new year, and still not done getting a whole lifes accumulated stuff in it's place - or throwed away.. wich is the hard part!